Biometrics gathers pace in payments: We take an in-depth look at the latest developments in a sector where interest is building very rapidly. 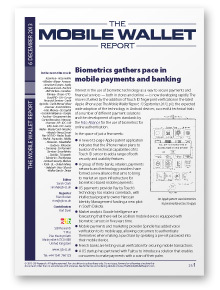 Fingerprints, voice prints, palm vein patterns, face recognition and iris scans are all now being tested for verifying a consumer’s identity for payments at the point of sale and to protect access to mobile wallets, online commerce, mobile banking applications, individual apps on a device and physical locations. Apple rolls out iBeacons to 254 US stores: The iPhone maker has updated its Apple Store app and implemented Bluetooth LE beacons in its US stores, making it possible for the iPhone maker to communicate with customers based on their location within a store. PLUS: Exact Editions tests iBeacons for Newsstand sales, Citi lets customers pay with rewards points for online purchases, Co-op Financial adds mobile card controls, and more. Organisations mentioned include Accenture, Accumulate, Alibaba, Alipay, Amazon, American Express, Apple, Banque Accord, Bar Kick, BNP Paribas, Carrefour Banque, Chase, China Bohai Bank, CITC-EuraRFID, Citi, Co-op Financial Services, Credit Agricole, Credit Mutuel Arkea, Discover, Exact Editions, Fido Alliance, GE Capital, Goode Intelligence, Google, Groupe Auchan, Groupement des Cartes Bancaires, Hanscan Identity Management, Harman, Hewlett-Packard, IDC, Internet Advertising Bureau, Judo, KFC, Leroy Merlin, MasterCard, Morpho, Mozido, Nexus Smart Pay, NXT-ID, Pay by Touch, PayPal, Payworks, Pebble, Placecast, PulseWallet, Quiznos, Robocoin, Samsung, Six Payment Services, SmartMetric, Spindle, Swiss Capital International, T Dispatch, Telemetrics, The Marque, The Natural Security Alliance, Tianjin Rural Commercial Bank, Total Group, UL, United Airlines, Validsoft, Visa, Xiamen Bank, XRomb, Walker Sands and Zwipe. 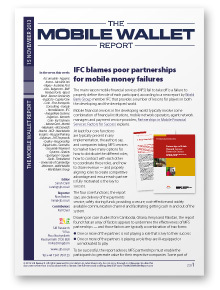 IFC blames poor partnerships for mobile money failures: A detailed new report from the World Bank member explains why many mobile financial services fail to take off and provides a number of lessons for players in both the developing and the developed world. Boston University’s Agganis Arena to accept mobile payments: PXT’s Looped In payments and marketing app for college students is gathering pace with 125 merchants now signed up in the Boston area and plans to expand to other US college markets in 2014. Timberland puts plans in place to roll out Bluetooth LE marketing: The move follows a pilot that recorded an average 75% open rate for the push notifications sent to shoppers, a 35% redemption rate for the offers received via the platform and a shopper satisfaction rate of more than 90%. PLUS: McDonald’s to roll out mobile payments in Belgium and France, Smartphone PINs revealed by camera and microphone, Belgian mobile wallet to launch as Sixdots in spring 2014, Australia Post offers QR code video stamps, Square abandons ‘all you can eat’ fees, and more. Organisations mentioned include Accumulate, Agganis Arena, Alex and Ani, Alipay, Australia Post, Avis, Belgacom, BNP Paribas Fortis, Bpost Bank, Boston University, BuzzCity, Capital One, Coin, First Annapolis Consulting, Google, HomeBeacon, IFC, ImageWare Systems, Ingenico, Kenneth Cole, Kurt Salmon, MasterCard, Mattel, Maybank, McDonald’s, Nacha, NCR, New Media Insights Group, PassportParking, Payleven, PXT Payments, Quirky, ResponseTap, Ripple Labs, Seamless, SecureNet Payment Systems, Sixdots, Sportpoint, Square, Swirl, Timberland, University of Cambridge, Walmart, w00t! Media and World Bank Group. 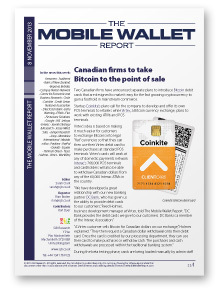 Canadian firms to take Bitcoin to the point of sale: Startup Coinkite plans to develop and offer its own POS terminals to retailers while Virtex plans to work with existing ATMs and POS equipment. Coca-Cola bottler launches mobile payments and marketing platform: Mexico’s Bepensa Bebidas has introduced a B2B mobile payments service aimed at supporting small neighbourhood merchants that have traditionally operated only in cash — and plans to add a consumer mobile wallet next year. PLUS: Jersey Mike’s designs its own POS terminals, Tesco to use facial imaging to target advertising content, Mondelez to target shoppers with smart grocery shelves, CEBR analyzes economic impact of mobile payments, and more. Organisations mentioned include Amscreen, Audkenni, Bank of New Zealand, Bepensa Bebidas, Campus Nation, Centre for Economic and Business Research, Circle, Coinkite, Credit Union National Association, DirectCash Bank, Early Warning, EFMA, Fico, Firstsource Solutions, Google, IHS, Infosys, Interac, Javelin Strategy & Research, Jersey Mike’s Subs, Juniper Research, Loop, Mondelez International, Mozido, nViso, Payfone, PayPal, Quividi, Square, Tantrum Street, Tesco, Valimo, Virtex and WorldPay. 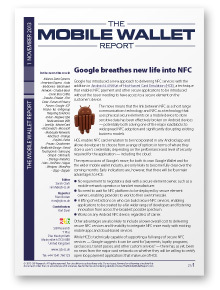 Google breathes new life into NFC: Android 4.4 KitKat includes support for Host Card Emulation (HCE), a technique that removes the need to store credentials on a physical secure element and has the potential to solve one of the major roadblocks to widespread adoption of NFC payments. Amex lets customers pay with Membership Rewards: Customers can pay their New York taxi fares with Membership Rewards points, setting the scene for a possible expansion of the loyalty programme into a new kind of virtual currency. Mobile location analytics firms agree to customer data code of conduct: Giving consumers a choice as to when and how they share information is crucial to preserving their privacy and keeping their trust, says the Future of Privacy Forum’s Sarah Gordon. 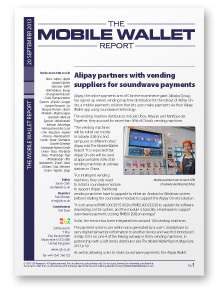 PLUS: Bluetooth LE beats NFC and QR in Qualcomm café pilot, Bluetooth push marketing campaign pays off for Vans, Biedronka rolls out mobile payments to 2,200 stores, Vogue Taiwan tests members-only vending machines, Google Glass gains payments apps, and more. Organisations mentioned include Alliance Data Systems, American Express, Asda, Biedronka, Blackhawk Network, Citadele Bank, Dunn Bros Coffee, Dwolla, Etisalat, First Data, Future of Privacy Forum, Google, ICP Polska, Iko, Infogroup Targeting Solutions, Intuit, Krajowa Izba Rozliczeniowa (KIR), LevelUp, MasterCard, McDonald’s, Microsoft, Mobiquity Networks, MyCheck, Orange, PayPal, Perka, Prezzo, Qualcomm, RedBottle Design, Retail Touchpoints, Samsung, Simple, Starbucks, Strategy Analytics, Vans, VeriFone, Vogue, Westpac, WoraPay, Zapp and Zappar. 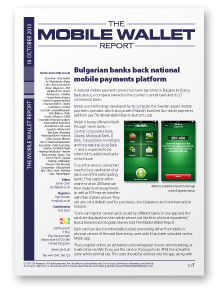 Bulgarian banks back national mobile payments platform: Borica Bankservice’s Bogdan Stavrev explains how the new Mobb platform works, how consumers can use it to store multiple bank cards from multiple banks, and sets out the platform’s plans for the future. National mobile payments service to launch in Colombia this year: Credibanco’s Luis Fernando Sierra Suarez and technology provider YellowPepper’s Serge Elkiner describe how the new Socia platform is designed to provide a way for local banks to attract lower income customers. Belgian bank and carrier get EU approval for mobile wallet joint venture: BNP Paribas Fortis’s Gunter Uytterhoeven explains how the new Belgian Mobile Wallet platform has been designed to meet merchants’ needs and how the bank and its telco partner Belgacom will implement the new system. 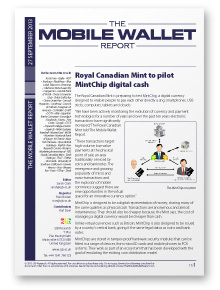 PLUS: US restaurant chains select Cardfree for mobile payments, NPCA gains support for mobile payments at the pump, Heartland expands merchants’ mobile payments options, One in four US consumers “very interested” in mobile wallets, and more. Organisations mentioned include Accenture, Accumulate, ACI Worldwide, Alipay, American Bankers Association, Banco Central do Brasil, Belgacom, BNP Paribas Fortis, Borica Bankservice, Cardfree, Central Bank of Kenya, Central Cooperative Bank, Checkers/Rally’s, Cibank, Credibanco, D Bank, EcoCash, eDigitalResearch, Fido Alliance, Flash Foods, Gilbarco Veeder-Root, GSMA, Heartland Payment Systems, International Asset Bank, Investbank, Leaf, Level, LevelUp, MasterCard, McKinsey, Mocapay, Municipal Bank, National Cyber Security Alliance, National Payment Card Association (NPCA), National Restaurant Association, Parks Associates, PayPal, Portaltech Reply, Redeban Multicolor, Reserve Bank of India, ROAM, SITA, Sonic Drive-In, Square, Subway, Tabbedout, Tencent, The Pinnacle Corporation, Tokuda Bank, Tsys, Ubox, Udi’s, VeriFone, Visa and YellowPepper. Amazon pushes into payments: The online retailing giant is to let its 215m active customers use their stored shipping and billing information to make payments at third party merchants across the web. PayPal details the technology it will be using to enable customers to make payments at Discover merchants — and indicates the new Payment Codes are to be integrated with the company’s new Bluetooth LE-based Beacon technology. Startup Loop unveils a mobile payment solution that works with standard magnetic stripe terminals — and uses NFC technology to secure users’ card data. Organisations mentioned include Affinity Solutions, Airtel, Amazon, American Express, Bank of America, Bitcoin, Capital One, CardLinx Association, Cardlytics, CardSpring, Cellum, CheckAlt, City National Bank, CU Wallet, Deem, Digimarc, Discover, Doku, DoubleBeam, Ecobank Transnational, Facebook, Fastacash, First Data, FIS, Fiserv, Front Flip, Google, InComm, Inside Secure, LearnVest, Linkable Networks, LivingSocial, Loop, MasterCard, mBlox, McDonald’s, Microsoft, Monitise, Nellymoser, Paydiant, PayPal, PushPoint, Ripple Labs, Safaricom, SmartMetric, SnapSwap, Square, Top Image Systems, Unistream, US Bank, VFX Financial, Walmart, Wired and ZipZap. 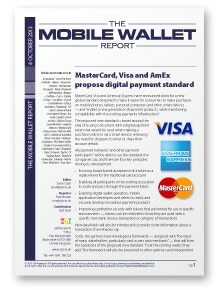 MasterCard, Visa and American Express propose new digital payment standard: Mike Matan, head of global network business at AmEx, and Jim McCarthy, global head of innovation and strategic partnerships at Visa, comment on the technology options, rollout timing and thinking behind the plan. Swiss retailers introduce mobile credit card app: Jérôme Gilg, CEO of DIY superstore chain Jumbo, explains how the service works and what the next steps are likely to be. Turkish bank creates customized mobile banking service: Deniz Guven, Garanti Bank’s SVP of digital channels, describes how customers can create their own mobile dashboard, choosing from 23 different wallet, savings, loans and offers options. Organisations mentioned include 22squared, Accel Partners, AdTruth, Adyen, American Express, Andreessen Horowitz, Bank of Hawaii, BilltoMobile, Blippar, Cardfree, Cisco, Clinkle, Clover, Crucialtec, Danal, DoubleBeam, Eftpos Australia, Facebook, FIS, Fjord, Garanti Bank, Homeland Stores, Iko, Intel Capital, Intuit, Jumbo, Kalixa Group, Leap Motion, LevelUp, Manor, MasterCard, Maus Freres Group, McDonald’s, MCX, National Australia Bank, Pantech, Parkeon, Paydiant, PKO Bank Polski, Rogers Communications, Sebastians Café, Shopular, Sonic Drive-In, Sprint, St George Bank, Stanford University, Subway, Vantiv, Visa, Walmart and Your Gym. 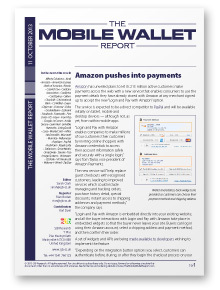 In the latest 12-page edition of The Mobile Wallet Report we cover Absa, Accenture, Apple, Astra Graphic Information Technology, Barclays, BlackBerry, Blue Label Telecoms, Braintree, California State Assembly, Capgemini, Central Bank of Brazil, Chaos Computer Club, Chili’s Grill & Bar, China UnionPay, Consult Hyperion, Corethree, Council of Fashion Designers of America, CU Wallet, Dallas Area Rapid Transit Authority (DART), Denton County Transportation Authority, eBay, Egyptian Banks Company, Escardgot, Facebook, Fawry, First Data, Google, GTCR, Hoyts La Premiere, Imperial College London, Legends, Major League Baseball, MasterCard, MintWallet, Mobilità di Marca (MOM), Monitise, National Bank of Egypt, Nedbank, New Jersey Transit, New York Yankees, Opus Global Holdings, PayPal, Pew Research Centre, Phoenix Marketing International, RBS, Royal Canadian Mint, South African Social Security Agency, Standard Bank, Taab, Tapingo, The T, TriMet, UniCredit, University of Southern California, Unwire, Venmo, Visa, Wessex Bus, Yoyo, YSPay and Ziosk. 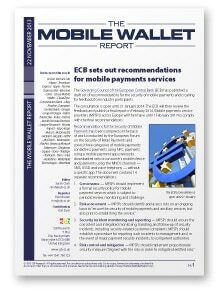 In the latest 12-page edition of The Mobile Wallet Report we cover Absa, Alipay, Apple, Aquabit Spirals, Barclays, BMO, BNP Paribas, Bump, Chunghwa Telecom, Cubic Transportation Systems, eFlorist, Google, Juniper Research, La Banque Postale, LikeUs Network, Major League Baseball, Marks & Spencer, Minifounder, Miyuan, Morinaga, Netvouchercodes.co.uk, Otto, Passforce, PayPal, Peerius, Pew Research Center, Rewe, Seatwave, Société Générale, Statewide Federal Credit Union, Tesco, The Body Shop, Thumbzup, Tigo, Tradedoubler, TRG Mobilearth, TrustE, Ubox, US Bank, Visa, Western Union, Yapital and Zapp.